Got a product or service to advertise that can’t be photographed? Are your workforce just not pretty enough? Then you should use stock photography! Or should you? In my last article I highlighted the dangers of using stock photography when I saw a photo I’d uploaded to a client’s website on TV. I’ve had to search stock photography websites many times for clients, and I’ve seen the same faces popping up time and time again all over the place (and all over the world in some cases! ): on websites, billboards, posters, leaflets and packaging designs. So I’ve compiled a list of photos I see everywhere. Maybe you’ve seen these too? Maybe you’ve even used them in your own projects (if so, I apologise now for what follows, but you might want to choose some new images!). Who is this guy and why is he writing on the inside of my screen? I usually see this blurry-faced pen wielder advertising web and IT services, sometimes drawing a meaningless diagram or chart of some sort. I’ve seen photos of this guy everywhere: leaflets, websites, in shops, on a bus – I just can’t escape from his cheesy stock photo face! What is it that makes him so popular? Was there a study done that proves his face appeals to the widest audience? Maybe he’s liked by all genders, ages and races. Statistically his face seems to be able to sell anything to anyone. Maybe it can also stop wars and poverty? Ahh, the good old masculine handshake! Representing trustworthiness, cooperation and partnership. I know what is symbolises, but I’ve just seen so many dry corporate websites using this same image, that I’m bored already. Can’t they think of something more original? 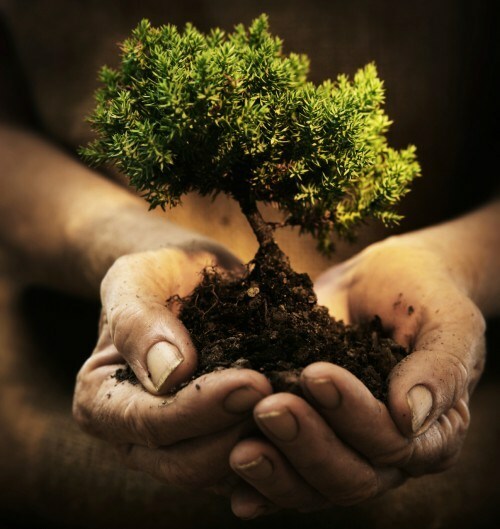 It’s the ideal image to symbolise growth: nurturing a little tree in your hands. A popular choice for websites claiming they’ll help grow your business (and maybe those selling bonsai trees). What’s with photos of incredibly attractive models with headsets? I suppose there’s nothing wrong with showing to your clients and customers there’ll be a friendly young woman taking your call, but photos like these are so common you’re not fooling anyone that she works for you! This is one of iStock‘s most downloaded photos of businessmen. Just type that in and I bet he’ll be on the first page. He’s also used in a lot of group shots, and I think I know why. You might see him mixed in with the handsome, young businesspeople so you can prove your organisation isn’t ageist. He reminds me of Harold Bishop from the Australian soap Neighbours. I’ve seen loads of photos like this on corporate websites where there’s an unwritten rule that all workplaces should be towering glass office buildings. They seem to be claiming that this is their immaculate and expensive office building, although in truth it’s a pokey office just off the M6 near Stoke. Just who do they think they’re fooling? Are there any more over-used stock images that you’ve seen again and again? Put a note in the comments and share them! Next Next post: Does image Alt text get used in Google’s rankings?